Drostanolone is an anabolic/androgenic steroid which can be either the Propionate ester or Enanthate ester of Drostanolone. 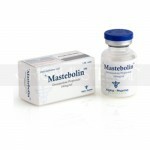 It is known to be highly androgenic and mildly anabolic steroid. It is incapable of aromatization, has similar properties to Dihydrotestosterone and it has been successfully used as a breast cancer drug. Drostanolone Propionate was first described in 1959. 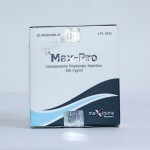 Syntex developed the agent along with other known steroids and approximately one decade later Drostanolone Propionate product was introduced as a prescription drug. Drostanolone Propionate is a derivative of DHT (Dihydrotestosterone) and does not convert to estrogen through means of aromatisation. 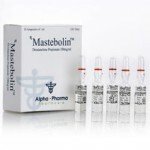 Drostanolone Propionate is used primarily by athletes who need to retain strength while losing mass. It is beneficial to runners and athletes who must remain in a certain weight class. Drostanolone Propionate can promote increased strength while keeping body fat the same or even lowering it, it also often help to prevent muscle loss while dieting. 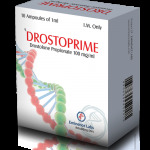 Drostanolone estered substances possess anti-estrogenic properties which results in the elimination of many of the unwanted side effects that, such as gynecomastia, water retention and dangerous increases in blood pressure. Its toxicity to the liver is very low, although side effects such as acne, hair loss and prostate enlargement are common. For notable muscle grow Drostanolone Propionate or Drostanolone Enanthate can be stacked with other steroids like Methandrostenolone or more potent androgen Testosterone. If water retention is a concern it can be combined with Nandrolone Decanoate or Boldenone Undecylenate. Drostanolone products are also quite suitable for athletes and bodybuilders in cutting cycles in combination with Testosterone Propionate, Trenbolone Acetate and injectable Stanozolol.